That creation care is part of the mission of the Church is widely accepted. But is creation also relevant to the other marks of mission? 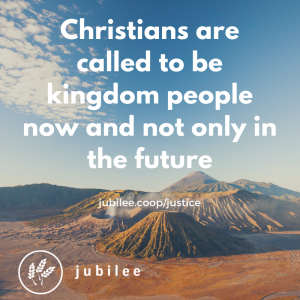 In the last of a four part series, Jubilee’s Matt Williams and Jonny Hanson look at justice. 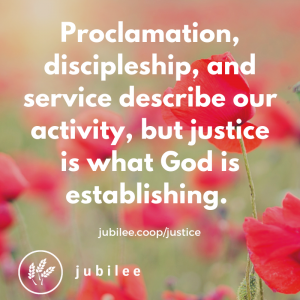 Proclamation, discipleship and service describe our activity, but justice is what God is establishing. Shortly after creation, when people had been given this beautiful world and its resources, they chose to take the one thing they were told to leave alone. From that point, justice has been horribly distorted. Yet the story of the Bible is punctuated by God fighting injustice, whether through the terrible flood (Genesis 6:5-7), prophetic warnings against corrupt religion (eg. Isaiah 1:11-17) or Jesus’ persistence in doing good, despite the establishment (eg. Luke 6:6-11). It is this inequality in how the marvellous bounty of planet earth is shared out that is at the heart of how creation and justice relate to each other. It’s also about the uneven distribution of the side-effects and costs, or ‘externalities’ in economist speak. With climate change, for instance, wealthier individuals, communities and nations have benefited most from fossil-fuel use over the last 150 years. 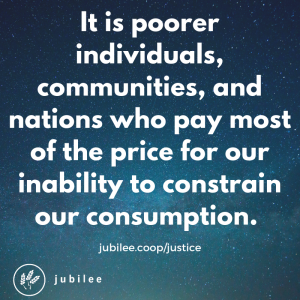 But it is poorer individuals, communities and nations who pay most of the price for our inability to constrain our consumption of this resource. Environmental justice, therefore, speaks of a world where the costs and benefits of creation are shared fairly among all. With food and farming we see another way creation and justice are connected. Approximately one third of the food produced every year around the world is wasted, while nearly a billion people suffer chronic malnourishment and over half a billion people struggle with obesity. 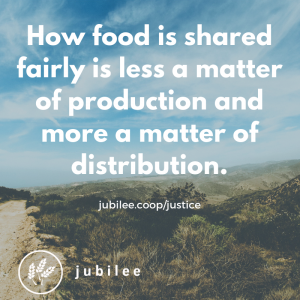 How food is shared fairly, though, is less a matter of production – we produce more than enough food every year to feed everyone on the planet – and more a matter of distribution. The principle of food sovereignty suggests that it is food supply chains that are focused on and controlled by communities, rather than markets or states, that best serve this goal. Peace and reconciliation is the third component of the nature-justice nexus. Many wars have been, are being, and will be fought over the control of natural resources. Even on our own island of Ireland, for example, we’re familiar with how certain groups displaced other groups from the best and most fertile land at various points in our history. It is therefore very appropriate that creation also be key to reconciliation, here and around the world. 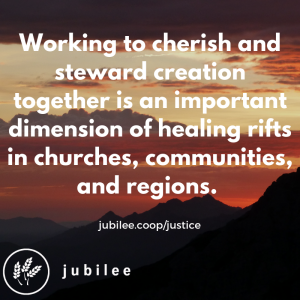 Working to cherish and steward creation together is an important dimension of healing rifts in churches, communities, countries and regions. 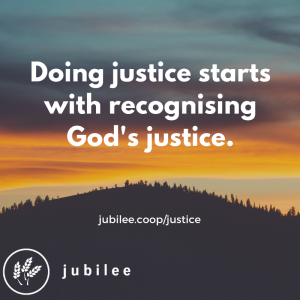 Doing justice starts with recognising God’s justice. When we do that, we should immediately see that we fall far short. But on a pair of wooden beams outside a Middle Eastern city, God atoned for our injustice in Jesus Christ. Unlike everyone else who has ever died, nature did not run its course with Jesus (Acts 13:32-39). In rising he was crowned the just king who is even now building his kingdom, calling people to repentance in order to be conformed in his image. Creation is where we live this out, which makes sharing resources, sharing food, and acting for peace all part of the highest possible calling.